The fields here belonged to All Souls College, Oxford from 1442. The medieval manor of Frith and Newhall lay to the north-east and was divided into Dollis, Frith, and Partingdale Farms by the mid-18th century. The modern era came early to Bittacy Hill when Mill Hill (later Mill Hill East) station opened on the Great Northern Railway’s suburban line to Edgware and the North Middlesex Gas Company built a gasworks in the 1860s. A pub and a few gasworkers’ cottages appeared nearby but the railway service to London was slow and indirect so commuters were not inter­ested and the surrounding area remained as farmland. In 1909 the Middlesex regiment moved into the Inglis barracks, which had replaced Bittacy Farm. A council estate, including flats, was built at the foot of Bittacy Hill in the mid-1920s. South of the station, Mill Hill Homesteads bought Devonshire Farm in 1933 and laid out an estate. Further up the hill and over on the Frith manor lands, roads were laid out in the years before and after the Second World War. The barracks later became the base for the British Forces Post Office, which has since moved to RAF Northolt. The unpre­pos­sessing Mill Hill East church was built in the early 1960s opposite the shopping parade on Salcombe Gardens. The Inglis barracks closed at the end of 2007 and plans were drawn up for the construction of around 2,200 new homes (with a small proportion for ‘affordable rent’) on the 83-acre site between Bittacy Hill and Frith Lane. 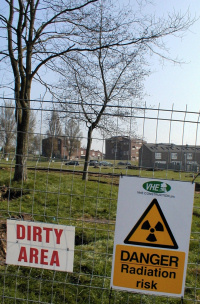 To oversee this prodi­gious project, the Ministry of Defence appointed a group called the Inglis Consortium, led by the Vinci /​ St Modwen joint venture, working in conjunction with Barnet council and the property management company Annington. Meanwhile, Crest Nicholson redeveloped the disused gasworks site with 250 homes, accom­panied by a super­market (a Waitrose, no less) and a Virgin Active health club. At the time of last updating this page, Millbrook Park (as the Inglis barracks resid­ential project is called) was about halfway complete, with schemes built by six different developers and homes ranging from low-rise blocks of compact apart­ments to five-bedroom detached properties with silly names like ‘The Brigadier’. The locally listed officers’ mess (1904) has been retained and converted into apart­ments by Linden Homes. The whole project is expected to be finished by 2025. Millbrook Park Church of England primary school opened in September 2014, under the aegis of the London Diocese Board for Schools Academies Trust. Ofsted assessed the school’s effect­iveness as ‘good’ following its June 2017 inspection. Its report found that the proportion of pupils who speak English as an additional language is higher than average, the proportion of pupils from minority ethnic groups is well above average and the proportion who are eligible for free school meals is below average. The school will ultimately provide places for around 700 pupils, including nursery provision. Unlike Mill Hill proper, this locality lacks buildings of historic signi­ficance, except to the north on Partingdale Lane, where the “pictur­esque stuccoed agglom­er­ation” of Partingdale Manor and Manor End and a well-preserved war room bunker (early 1950s) are grade II listed. The latter is the sole survivor of four regional command centres that served London during the Cold War and was designed to protect its occupants from the effects of nuclear attack. To the east, a Neo-Jacobean mansion called Nether Court (early 1880s, by Percy Stone) is now the clubhouse at Finchley golf course. The Inglis barracks were named in honour of Lieutenant-Colonel William Inglis of the 57th infantry regiment, who was killed at the battle of Albuhera in 1811. Inglis coined the phrase ‘die hard’, which was his last order to the troops, and the 57th were afterwards nicknamed the ‘diehards’. In 1988 23-year-old soldier Michael Robbins was killed and nine others were injured by an IRA bomb at the barracks. 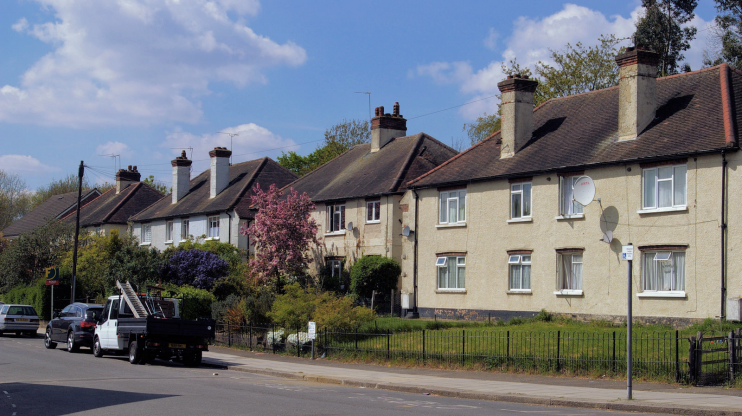 * The picture of houses on Sanders Lane, at the top of this page is modified from an original photograph, copyright Christopher Hilton, at Geograph Britain and Ireland, made available under the Attribution-ShareAlike 2.0 Generic Licence. Any subsequent reuse is freely permitted under the terms of that licence.